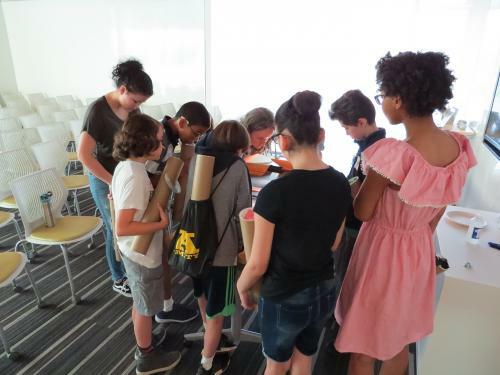 On May 5, 2018, 41 students in the Yale Pathways to Science program came to Wright Laboratory to discover the invisible universe. The students, who ranged in age from 6th to 12th grade, undertook hands-on activities from 9 a.m. to 1 p.m. to experience how Wright Lab researchers - and each of them - can make the invisible visible. The event began with an introduction by Dr. Karsten Heeger, the Wright Laboratory Director, and a tour of the laboratory facilities. 1) Tour of a research lab - The power of light: Postdoctoral Associate Fernando Monteiro and Shilo Xia, GRD ’20 demonstrated how there are forces exerted by light and students trapped microspheres in a special laboratory optical trapping setup. 2) Building instruments for experimentation - The structure of light: Jeremy Gaison, GRD ’21 and Professor David Moore led students in building and experimenting with their own CD spectrometer to see the varied structure of light given off from different kinds of sources. 3) Cryogenics - Changing states and unseen forces: Charles Brown, GRD ’19 demonstrated several different strange and exciting properties of matter using cryogenics in the research laboratory to shatter racquet balls, levitate objects and shrink air-filled balloons. 4) Using scientific instruments - Detecting the invisible energy around us: Postdoctoral Associate Tom Langford led the students in using a Geiger counter and a muon detector to detect the natural radiation present in several common objects and in the atmosphere. 5) Cloud chamber - Observing cosmic rays: Professor Sarah Demers led the students in observation of the evidence of cosmic rays using a cloud chamber. 6) Large projects and analyzing data: Interpreting clues from the invisible: Christian Weber, GRD ’20 and Michael Oliver, GRD ’20 provided a VR tour of ATLAS, the large instrument that Wright Lab, in conjunction with other institutions in the international ATLAS collaboration, has built and is currently upgrading. Students also were shown ATLAS data visualizations (“events”), and worked on analyzing what occurred in each event. After the students were treated to a pizza lunch, courtesy of Yale Pathways to Science, they were able to interact with all of the volunteers during a question and answer period. The program closed with a raffle where students could win prizes for having earned tickets for being engaged throughout the day. In addition to the activity leaders and Heeger, the other volunteers for the event were Jeff Ashenfelter, Wright Lab Associate Director for Operations; Kelly Backes, GRD ’22; Ivy Huang, GRD ’20; Hannah Kwak, YC ’19; Emily Kuhn, GRD ’22; and Associate Research Scientist James Nikkel. The event was coordinated by Maria Parente from Yale Pathways to Science and Victoria Misenti from Wright Lab. Please also see our gallery of images from the event.